What Is an MNY File? A file with the MNY file extension is a Microsoft Money file used with the now-discontinued Microsoft Money finance software. Microsoft Money can store financial accounts for checking, savings, and investment accounts, so multiple account data may exist in a single MNY file. Microsoft Money also uses the .MBF (My Money Backup) file extension, but it's used to indicate an MNY file that has been backed up for archival purposes. Microsoft Money was discontinued in 2009, but you can still open your MNY files with Money Plus Sunset, Microsoft's own replacement for the Microsoft Money software that can open not only MNY files but other Microsoft Money file types too, like MNE, BAK, M1, MN, MBF, and CEK files. Money Plus Sunset is limited to opening Microsoft Money files that originate from the U.S. versions of the software. MNY files can be protected behind a password. If you can't open your MNY file because you've forgotten the password, you might want to try the Money Password password recovery tool. It's not free but there is a demo that may prove to be helpful. I have not tried it myself. Some other financial programs, like Quicken, will also open MNY files but only for converting to that program's native format. The steps for doing this are pretty straightforward and explained below. If Microsoft Money or Money Plus Sunset aren't opening your MNY file, be sure you're not misreading the file extension. Some files have a very similar file extension but have nothing at all to do with each other, such as the MNB file extension. 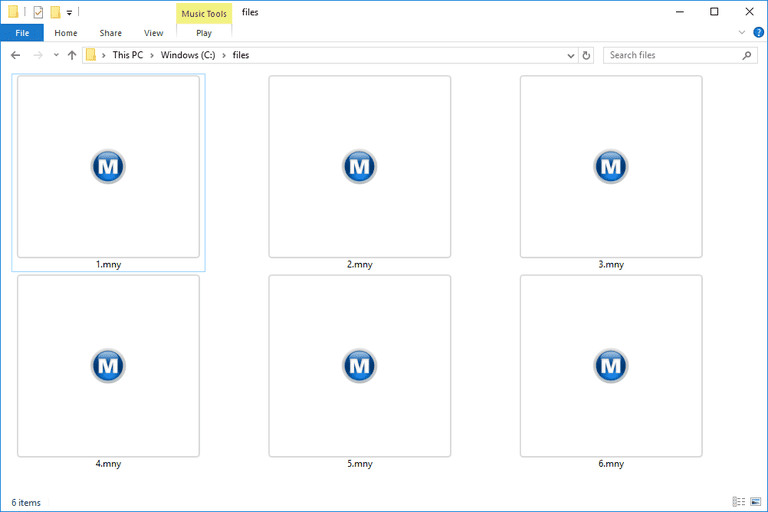 If you find that a program you have installed already tries to open the MNY file but it's the wrong program, or if you would rather have another installed program open MNY files, you need to change the default program for a specific file extension to make that change. Most file types can be converted using a free file converter, but the MNY format isn't one of them. The best way to convert an MNY file is with a financial/money application that recognizes the format. If you're currently using Money Plus Sunset but are in the process of transferring your data over to Quicken, you can use Money Plus Sunset's File > Export... menu to save your financial information to a Quicken Interchange Format (.QIF) file, which can then be imported into the Quicken software. If you don't want your MNY file to remain in the QIF format, you can use the QIF file with QIF2CSV to convert the data to the CSV format, which you can then use in Microsoft Excel or another spreadsheet program. This tool can also save the QIF file to PDF and Excel's XLSX and XLS formats. Quicken can convert an MNY file to a file that works with its software through Quicken's File > File Import > Microsoft Money file... menu option. Doing this will create a new Quicken file with the information that's in the MNY file.